"Power Up" with ITW Dynatec and stop wasting time and money on inefficient hot melt operations - improve operator safety, reduce downtime and enhance production with the unbeatable service and support you can only get from ITW Dynatec. 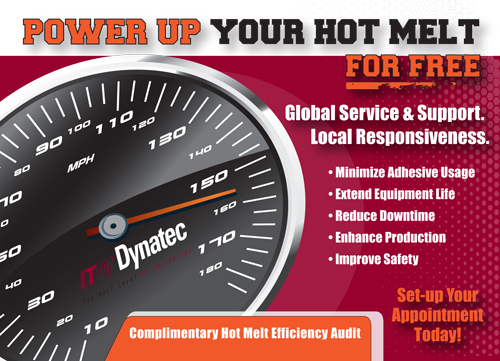 With our complimentary hot melt efficiency audit, an experienced ITW Dynatec service technician will visit your facility to review your hot melt operations, provide a comprehensive report of recommendations and answer any questions that you and your staff may have. Don't wait, contact the service department at ITW Dynatec today to schedule your complimentary efficiency audit!